Live it! 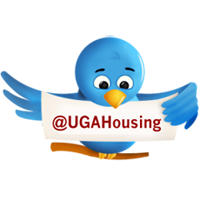 UGA Housing: Open House Tour Volunteers Needed! Open House Tour Volunteers Needed! We're looking for people in the following halls to show off their rooms during our open house tours: Brown Hall, Building 1516, East Campus Village, Mary Lyndon Hall, Myers Hall, Oglethorpe House, Payne Hall, Reed Hall, Rutherford Hall and Soule Hall. Open house tours are a great way to show off your space and to tell people why you like your residential community. Tours are noon-5 p.m. on January 10, 17 and 30 but you don't have to volunteer for every day. If you and your roommate both participate, you can take turns leading tours and just hanging out in your room. If you're interested in being a tour volunteer, please email University Housing Senior Public Relations Coordinator Carrie Campbell at carrie.campbell@uga.edu. Don't forget to indicate your own interest in living on campus next year by logging into The Dawg House by January 31!